On a grey Tuesday afternoon, I hopped on a train heading out of Piccadilly towards a part of Greater Manchester I’d never explored before. Well, technically Greater Manchester, though being just on the outskirts, Hale feels far more like Cheshire, darling. My trusted wingman Ruby and I were off to The Hale Grill, part of the Blackhouse family, for ‘The Spirit of Hale’: an evening of tasting spirits and mixing cocktails. It’s a hard job, but someone’s got to do it..! Rocking up at the venue, it immediately struck me as somewhere I’d love to bring the in-laws. Classic, good quality décor, a warm welcome, and a relaxed atmosphere; yet all of these paled in comparison to the Portobello Road gin and Fever-Tree tonic which was handed to us on arrival, garnished with an elegant curve of lemon zest. These guys know how to do things right. Already a fervent Fever-Tree convert (I have been known to wax lyrical to my long-suffering friends about the importance of good tonic water), Portobello Road gin was new to me, but I soon discovered how its soft citrus sweetness worked perfectly in this simple drink. Before long, we were invited upstairs to the private dining room, where nibbles were served: chicken satay skewers, extravagantly tentacled calamari, little fishcakes and remarkably tasty spring rolls. This glorious array would have rather derailed most groups, but we had our eyes on the prize – a tantalising array of bottles lined up at the front of the room. We were told that we were going to sample four spirits, each available at the bar downstairs. A Drinks Enthusiast-led tasting session, Dave poured us all a generous slug of Grey Goose vodka, and gave us a brief history of the brand. Only widely available in the UK since 2001, this French vodka was the brainchild of Sidney Frank, who wanted to create a premium vodka, sippable and luxurious. 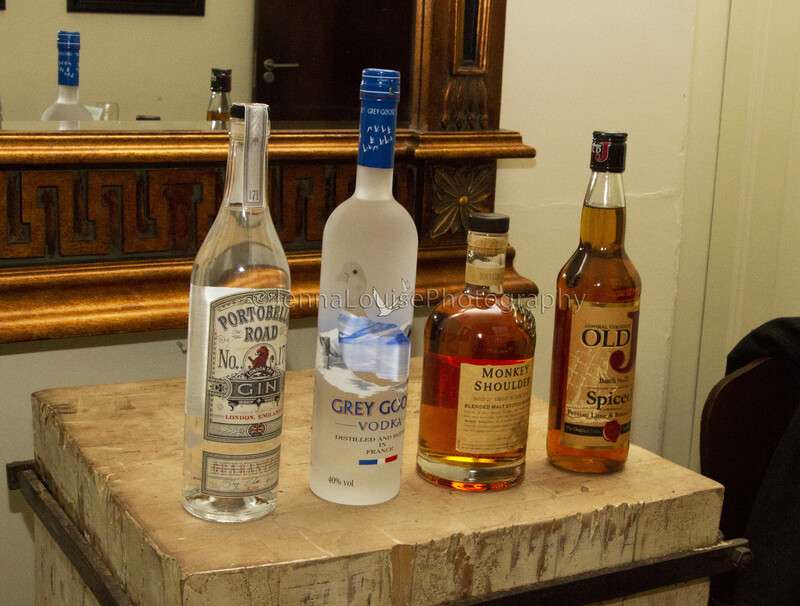 Frank decided on France as the origin of his vodka, touring distilleries and wineries – it’s alright for some, eh? – and thoroughly immersing himself in the alcohol culture which has such a long and excellent pedigree. Grey Goose uses soft winter wheat, which gives it a smooth, creamy quality. Those of us who are familiar with drinking cheap supermarket voddy (oh, those heady student days!) will be delighted to know that Grey Goose does not have the harsh burn which many of us are familiar with, instead lending a delicious warmth. Members of our group with particularly well-trained palates identified a hint of fresh green apple, accompanied by a suggestion of almonds and butter. Though I’m no sommelier, I put all of my palate training to the test, and thought I got a faint sense of dried apricots hidden away in there. All in all, a delightful vodka, and one I hadn’t experienced before. For our second spirit, we took a trip back to our earlier g&t, this time sampling the Portobello Road No 171 London Dry gin without the Fever-Tree tonic. In addition to the pre-requisite juniper, Portobello Road featured lemon peel, bitter orange, orris root, liquorice, angelica root, nutmeg, cassia bark, and coriander seeds. A pleasantly citrus-forward gin, the liquorice adds depth but is not intrusive, and the coriander rounds it all off with a slightly peppery finish. Next up was Monkey Shoulder, a blended whisky. The unusual name comes from an injury (thankfully, now confined to history) frequently suffered by workers shovelling grain all day, whose repetitive lifting motion would lead to a one-sided stoop. Charming! The whisky itself was smooth and light, intended as a gateway to the whisky world. Sweet in a typical Speyside fashion and very accessible, this whisky launched in 2005 and has been converting non-believers ever since. I’ve been assured that it absolutely sparkles in a cocktail. The last of the spirits, we came to a particular favourite of mine: Admiral Vernon’s Old J Spiced Rum. Technically a rum-based spirit, as it only weighs in at 35%, it is nevertheless outstanding in its category. So full of vanilla, toffee, honey and cinnamon, this sweetness is balanced by the ever-present lime. A historical character, Admiral Vernon enforced a reduction in the strength of the rum ration received by his crew. When the men complained, he implemented the addition of lime and spices, to create a deliciously palatable drink which more than made up for the loss of ABV. Perfect with all of your standard rum mixers – rum and coke, rum and ginger, rum and Ting, rum and milk! – this remarkably versatile spirit works with them all. Their newly launched overproof version, Tiki Fire, 75.5%, rocked my world the other week at the Northern Restaurant and Bar show. Keep your eyes peeled for it in bars around town. Four spirits sampled, and lots of fascinating info absorbed! But the night was not over yet. We trotted downstairs to the bar, where we were presented with a choice of two cocktails: An Apple, Mint, and Raspberry Stoli Cosmopolitan, or an Old J Spiced Rum and Honey Daquiri. Well, Ruby and I decided that the only sensible thing to do was order one of each and share. The Cosmo was beautifully delicate and freshened by the mint, while the Daquiri was remarkably piquant, its potentially heavy sweetness lifted by a whole load of lime. Some of our group even decided to step behind the bar and mix their own cocktails under the expert eye of the bartender; a highlight of the night, and an experience which The Hale Grill actually offers to the public in their Cocktail Master Classes. Ruby and I also decided to explore the cocktail menu a little further; well, it would have been rude not to! I ordered a Black Forest Martini which was possibly the most decadent cocktail I’ve ever had – the cream float layered over a sea of deep purple fruit liqueurs was insane – and Ruby decided on the Sloe Gin Crush. How can you say no to a combo that involves sloe gin, elderflower and passionfruit? Both were elegantly presented and tasted fantastic. If these cocktails are tempting you, get a new skill under your belt by learning to make them yourself! You can book in on a Cocktail Master Class in a private area of the restaurant and practice making your choice of classic cocktails in a lighthearted environment, under the expert tutelage of professional bartenders. The Hale Grill are currently in the process of revamping their cocktail menu for the summer months, bringing in some light, refreshing, seasonal treats, and for those of you who fancy something hoppy, they have a frequently rotating beer menu, featuring some of my old favourites – Thornbridge Wild Swan, anyone? They also have an extensive wine selection for you grape fiends. Thanks to Kerry of The Hale Grill for her hospitality, and to Dave for talking us through a great selection of spirits. A fantastic evening, and one sunny afternoon I’ll definitely be making the short train ride back out to Hale to sample their new summery cocktails. Cheers!